Boys in skirts. - general non-furry discussion - Furtopia | Family Friendly Furry Forum and IRC Chat! school rules won't let them wear short pants. I don't blame them for wanting to be cool. Well, kilts are popular in some parts of the UK IIRC. Exactly. Men were wearing skirts (kilts) long before skirts were worn by women. They're no skirts ye bunch of neaps! They're kilts! Skirts close on thae left side, kilts on thae right. It's a small distinction but an important one lol. From a heath view. 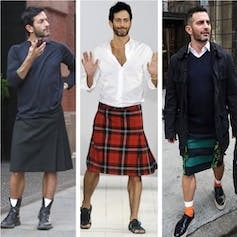 A skirt or kilt is healthier for a man to wear than pants. Keeps parts of the body from overheating. And dryer. who needed more protection than a wrap would give. more masculine, and it has spread around the world. they do you can be sure they wear leg wraps as well. Eh, I have to say I generally think fashion between men and women make no sense to me anyways. I'd say people need to rethink fashion. A part I can understand, like only women have bras (as most men don't need it unless you have a lot of fat stored up), but stuff like skirts being banned for boys... I fail to make sense of that. I think feminine clothes can make men look just as good as masculine clothes can make women look good, but somehow the world is treating those things like they're evil or something like that. Though men with more feminine looks are seen as "evil" more often then women with more masculine looks. And that's another thing I don't get. I'll stop now, I don't want my brain to explode. I probably couldn't care what a man or woman wears. It's their life. They can do what they want. But just be prepared to deal with the consequences if somebody doesn't like something that you've done. Should men wear skirts and/or any other feminine clothing? Hard to say. Depends on the body type and style of clothing worn. Some feminine stuff may look good on a man, while other stuff won't. As I said before, men were wearing skirts long, long, long before women were. Scottish men were or still are wearing kilts, and Roman soldiers from centuries ago wore skirt type garments. Some stores and companies have been trying to come out with more "unisex" clothing that a man and/or a woman could both wear in the last few years. How far this endeavor will take off remains to be seen. men don't, gets back to culture. Unisex clothing? You mean like bluejeans and T-shirts? : ) Truth is there's way to much difference in a man and woman's body. Not just with the reproductive organs. The overall shape of the body. Guess they could come out with designer long jerkins and loin cloths. Kilts! Invented by a people even the Romans found too hard to conquer! figured it was to make life easier when nature called..
type of battles they had. According to Ripley's, the Romans actually banished citizens for wearing pants. Now THAT'S and interesting way to live! Still, I can't imagine crawling under constantine wire these days would be very easy in a kilt. Especially if you had to back up. In a fashion announcers voice. 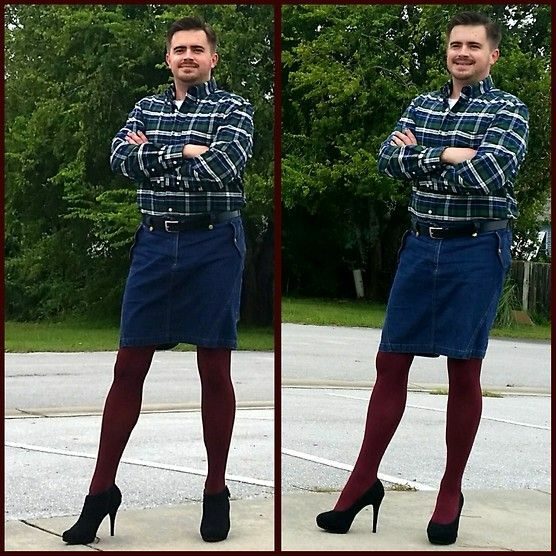 "And here we have Chad in a knee length jean skirt, paired with a nice pattered shirt, burgundy tights, and high heels. Ready for a casual stroll around town or a day at the office, etc." Here the same thing happened, but the train ticket-inspectors did this because of the same reasons, against the mindless company rules.